When a HealthAlliance Hospital pharmacist unexpectedly injured his shoulder, he knew exactly where to go. For weekend warrior Christian Harmuth, a routine play brought a dramatic end to a softball game at Kingston Point Park in July 2017. An avid golfer and hiker, Harmuth fielded a ball, threw it in, “immediately heard a loud pop” and couldn’t lift his arm. While the injury was unexpected, his first stop was not. He headed immediately to the Emergency Department at HealthAlliance Hospital: Broadway Campus, a member of the Westchester Medical Center Health Network (WMCHealth), where he worked as a pharmacist at the time. While “it was strange to experience it from the patient’s perspective,” Harmuth was impressed with the swiftness of care. “After only waiting 10 minutes, I was taken to Fast Track (where non-life threatening injuries are treated), and cared for almost immediately,” he recalls. “The emergency staff did a great job explaining everything they were doing and the tests I was having done.” Harmuth was in and out in about 90 minutes. The Emergency Department referred Harmuth for an orthopedic consultation. When an MRI confirmed a torn labrum and bicep tendon, Harmuth consulted with Stephen Maurer, MD, Chairman of Surgery and Medical Director of Orthopedics at HealthAlliance. 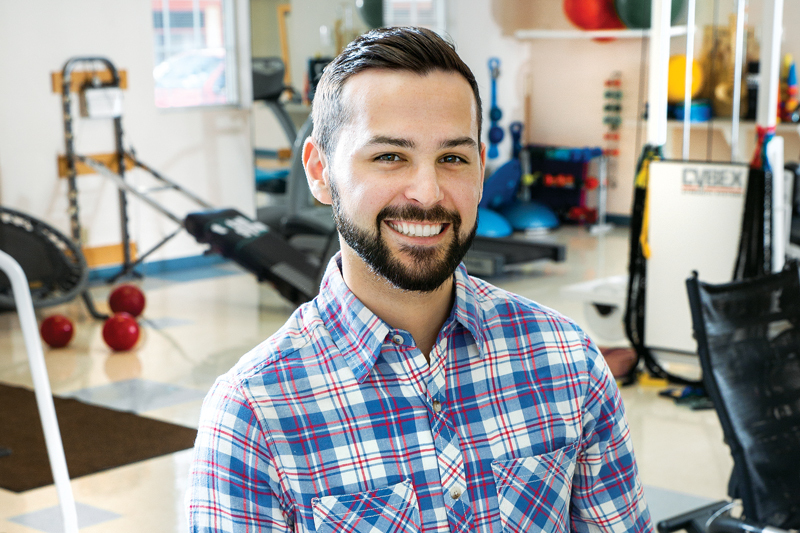 Harmuth continues to make progress in outpatient intensive physical therapy at HealthAlliance with the help of therapist Adam Castiglione. Dr. Maurer specializes in sports medicine and injuries to the shoulder —expertise honed through his experience as an assistant team physician to Los Angeles sports teams, including the Dodgers, Lakers and Kings. Harmuth felt especially comfortable with Dr. Maurer; he had turned to him a decade earlier for surgery of a torn rotator cuff and labrum in the same shoulder. 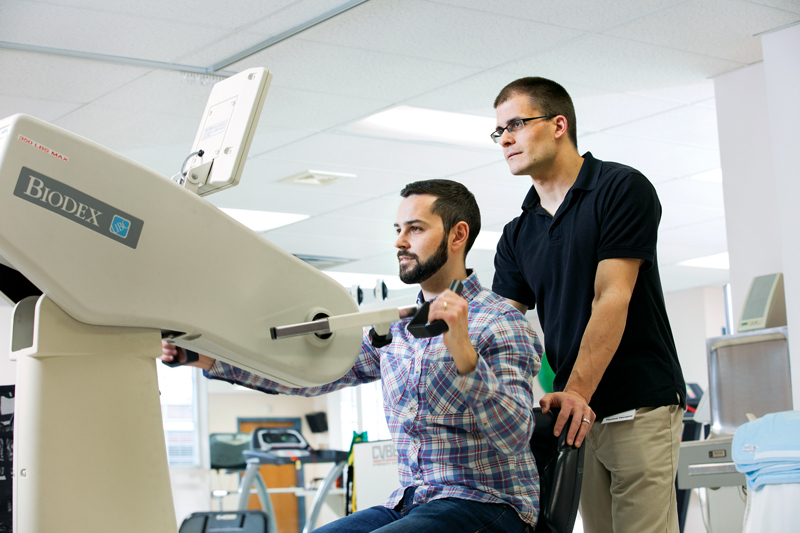 Dr. Maurer and Harmuth agreed to begin with the least-invasive option, physical therapy. For two months, Harmuth had therapy at HealthAlliance. While the treatment did help quite a bit, ultimately it could not resolve the injury. Dr. Maurer shared his plan, thoroughly reviewing how long surgery would take, how he’d repair the injuries and recovery time. This open line of communication highlights Dr. Maurer’s approach. “I want to be sure that the patient is onboard and comfortable with the plan, and I wait to operate until I know this,” he says. Relief was a priority for Harmuth, but there was one glitch – albeit a positive one: He was about to get married. So, following a January wedding and a honeymoon, Harmuth had the surgery. Harmuth continues to make progress each day with a regimen of outpatient intensive physical therapy at HealthAlliance and a dose of patience. “At first I thought I’d never recover, but then I started to see visible progress after each visit and began to really enjoy it. I almost have full range of motion back and have started resistance training at physical therapy,” says Harmuth, who hopes to complete therapy this summer.